Globalization is dead: what now? In the four decades I have closely followed global affairs, I have never seen the world in such a state of pronounced upheaval. Even the end of the Cold War seems tame compared to the changes now at hand. In 2015, I have observed the intersection and collision of multiple global mega-trends, each of which has underscored my belief that we truly live in what Charles Dickens termed “the best of times…and…the worst of times”. The best of times proposition is obvious. Many of us live it on a daily basis. Our lives are increasingly enriched by choice and ready access to better information and greater opportunities than any humans who came before us. Global poverty and communicable disease are rolling back at the fastest rates in world history, thanks not least to innovative public-private partnerships. While the media dwell on disharmony in our societies, polling of young adults the world over show a growing cosmopolitanism – a more positive view compared to their elders on issues of diversity, the use of non-military tools of international engagement, and environmental stewardship. Yet, most of us spend our time understandably concentrated on the contours of the worst of times, because these are increasingly shocking, unnerving and immediate. The post-global financial crisis economic recovery has entered yet another phase of discord, this time with further divergent monetary policies between the world’s largest economies, and a growing crisis of confidence in emerging markets. Geopolitics is boiling over in regions around the world, with new and old rivalries reignited. Violent extremists seem to be gaining ground, including with surprise attacks in the heart of G20 countries. Related, populist politics has reared its ugly head in democracies in a way we haven’t seen in decades. In a world of uncertainty, more citizens fall prey to the reassurance that identify politics and the casting of blame can bring. I am hardly alone in diagnosing the current state of affairs. I find in my conversations with senior business and government leaders the world over a shared perspective that we have crossed over the edge of the map into terra incognita. The challenge, then, is to figure out the dangers and opportunities of this new terrain. Charting the seven years since the global financial crisis, my colleagues and I at A.T. Kearney’s Global Business Policy Council posit the effective end of the period of world history known as globalization, and the emergence of four potential new global economic orders to follow, each with substantially different outcomes for governments and multinational companies alike. Globalization 3.0: A welcomed return to global integration and growth that has proven so elusive since 2008. Polarization: A world of heightened big power tensions, fueled by increasing Sino-US competitive friction and animosity. Islandization: Growing global, regional and sub-state fragmentation and atomization driven by identity politics and social media. Commonization: A post-capitalist world of localized, low-cost production and more modest patterns of consumption enabled by advanced technologies and dramatically different youth attitudes and behaviour. While it is the default assumption of many in government and business that we may yet embark on Globalization 3.0, I find that proposition highly dubious. And while the history of great power conflict may suggest that a “G2” or polarized world between the US and China is likely, that is an overly simplistic prescription for a highly complex relationship in a highly complex environment of mutual vulnerability and broader shared interests of prosperity. It is my belief that we are heading toward a blend of Islandization and Commonization. World transformation is powered first and foremost by the mega-driver of technology, which in turn is central to both of these worlds. The most significant change in the past seven years of world history is that we have entered into a period of sustained technological progress. I fully expect in coming years further breakthroughs in areas including alternative energy, biotechnology and artificial intelligence that dramatically change our economies and our societies. Unfortunately, I am less sure that technological change will be positive. The exploitation by violent extremists of social media is a case in point of the double-edge that new technologies can bring. This is an extremely disruptive and dislocating time for individuals, organizations and governments alike. 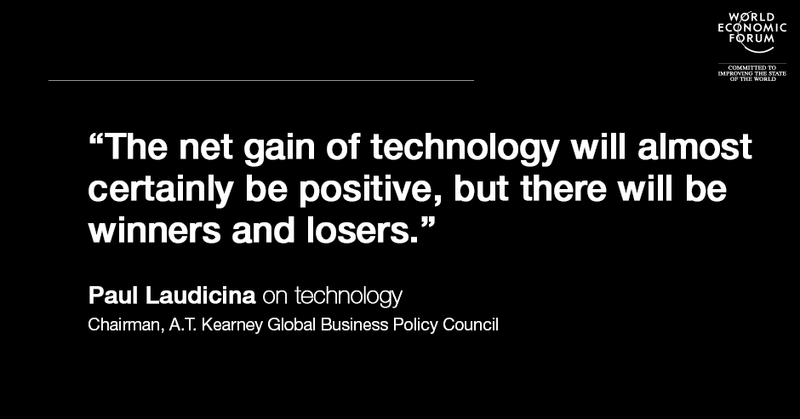 The net gain of technology will almost certainly be positive, but there will be winners and losers, and losers will not necessarily go quietly. Nor will the winners necessarily perceive objective gain as actual gain. And some new technologies, such as the gene-editing powers of CRISPR, point to a highly uncertain future. In our days together in Davos, I will focus my conversations on this new age of exploration in a post-globalization world. As the next global order takes hold, organizational foresight and agility will be critical in determining winners and losers in the new global operating environment.